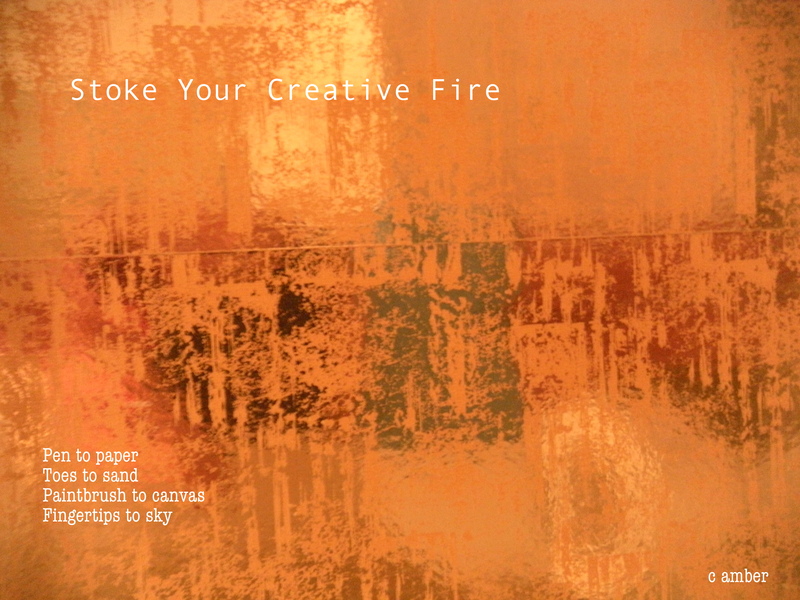 The creative fire can be like a fever–a burning, thrashing furor that you can’t stop–what you’ve started has taken off, unraveling in brilliant pulsing light–and you are overtaken by the desire to keep up, to capture every spirited piece of this enchanting flurry unfolding before you. But then there are the dry spells. The times when your creative fire burns low. But when you hit these periods of low light, there are things to do. There is the mustering of will, the just do it attitude, the sitting in the chair shutting off the internet silencing the cellphone stamina, and the hard work of rubbing kindling until you have blisters and draw blood, until there is that spark. My friend says she writes because she cannot not write. Even when she doesn’t feel like writing, she writes. She wakes up in the dark morning hours, her girls and husband still filled with deep breathing, the scent of sweet sleep, and furiously types to reach for 5 page daily quota. She’s confessed she would go mad if she didn’t. If I didn’t release it, get it outside of me, where would it go? The writer who writes daily is productive. This seems too simple. Annoying, really. But by writing a few words or sentences in a notebook to capture sunrise or a thought that links to another thought, you give your sentences, craft and work fuel. And it is this desire, this drive, to wake in the early morning hours, to stay up late, to wander into the moonlight or barefoot into a stream, or dance to the beat of any drummer in your beautiful mind or the symphony that only you can wield, that draws out the wildness, that feeds your fire. By writing, we automatically write more. Creativity is a muscle, the more we stretch it, the more we tap into it, the more readily it appears, the more often we are struck by its beautiful gifts. For me, it’s like the excitement I get from an impending storm, the shiver that runs up my spine with the howling wind–the electric feeling that something is being stirred up, awoken from its resting place, blown to life. Writing Prompt: What keeps your creative fire burning? What dims your light? Set a timer for a few minutes and make detailed lists answering both questions. Set an intention, in writing, for the coming week regarding how you will stoke your creative fire. Set aside time to write daily. Keep your pen warm and your flint handy.